Gadsby’s Hymns was compiled by William Gadsby in the mid 1800s. Although William Gadsby contributed quite a few of his own hymns, the bulk of the collection is comprised of many different hymnists. Long-beloved writers such as Charles Wesley, Isaac Watts, John Newton, Anne Steele, Joseph Hart and William Cowper fill the pages of this wonderful hymnal. Gadsby’s Hymns has been so important to us that we could not stop writing from it. Even before we had completed our last collection of hymns, The Gadsby Project, we knew we would make another record devoted to these beautiful, forgotten texts. 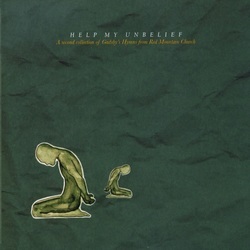 We decided to call this record Help My Unbelief. Many of the texts in these particular songs carry themes of doubt and longing. We believe that the Christian life is a complexity of emotions, a marriage of sorrow and joy. Valleys and mountaintops. Light and darkness. The hymn writers of the 17th, 18th and 19th centuries seem to have captured these tensions with more honesty and depth than many contemporary writers. Because these writers have given us glimpses of their own doubt and unbelief, working through their hymns has given us much hope. Hope that we are not alone. Hope that sorrow, pain and hardship are not exclusive to our small, believing community here in Birmingham, AL. Rather, that Christians from different parts of the world, hundreds of years ago struggled with the same things. This is one reason why we sing hymns, to remember that the Church is bigger than just us at this moment. We hope you will join us in confessing, "Lord I believe; help my unbelief." Believing that in our doubts and fears Jesus will meet us with patience and grace. This collection of hymns is for God’s prodigals and sojourners as they wait patiently for the Kingdom to come. "Help my unbelief. My help must come from Thee."